Fun and fitness come together in the best way possible when you’re bouncing up and down on a mini-trampoline. Toddlers and kids are generally very playful and have a lot of steam to blow off; a mini-trampoline, or a rebounder, makes for a safe and fun channel for all that excess energy. Thanks to the low impact on your joints, your ligaments and joints are well-protected and the chances of injuries are cut down to a large extent. Helps to tone the muscles. Improvement in your immune system. Helps improve cardiovascular fitness and overall muscle health. Effectively burns large amounts of calories. Can flush the lymphatic system, where many toxins in the body are stored. A safe and fun form of exercise, that can be done indoors as well as outdoors. There is a staggering range of mini-trampolines available today for the prospective buyer; varying in size, quality, design as well as brands, colors and shapes, the options can seem a little confusing. We have put together a buyer’s guide and reviews of some of the top-quality mini-trampolines out there today, so you can take your pick. While there are mini-trampolines available in all price ranges, the models with high price tags tend to be longer-lasting and provide better protection overall. 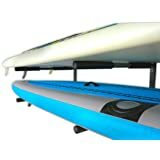 What Type of Mini-Trampoline Do I Want? Mini-trampolines come in various shapes and sizes, and are available across different brands. Quality should be your top priority, the importance of which we elaborate on below. 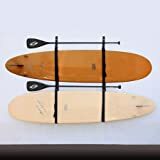 These exercisers also come in foldable and non-foldable models, with both being equally durable but the former being much more convenient for day-to-day use. When it comes to the highlight of the mini-trampoline, its bounce, you have the choice between a spring trampoline and a bungee cord trampoline. Spring trampolines have a much shorter suspension and hence, there is less elasticity and thus, there is less bounce. They generally tend to be on the less expensive side, have shorter lifespans and need a certain amount of maintenance, compared to their bungee cord counterparts. These constitute of the mat or base tied securely to the rim with durable, elastic cords. This is why the user can bounce higher on a cord bungee mini-trampoline without worrying about sustaining injuries, as the impact is also lighter on joints and ligaments. This ultimately translates to a much better workout for a longer duration, without exerting or causing injury to your muscles. These bungee trampolines also last a long time, make less noise and require minimal maintenance. Let’s take a look at the factors to take into account while going about choosing a mini-trampoline that’s just right for you and your family. 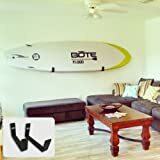 What Should I Look for in the Quality of the Mini-Trampoline? Quality is a factor that is just not worth compromising on. Not only does a low-quality mini-trampoline prove to have a shorter duration of use, it could also possibly be dangerous for those using it. A poorly-designed mini-trampoline created with low-quality materials stands the risk of beginning to sag very quickly, as well as that of the spring supporting the framework flying off in case the exerciser loses enough shape. The quality of springs determine how long the exerciser can maintain its shape, and bounce also deteriorates pretty quickly over time, so getting a mini-trampoline with high-quality springs is definitely in your best interest. Bottoming out, or becoming so loose that they reach the floor, is another common phenomenon that can be extremely risky and potentially injurious, for the user. Suffice to say, there’s too much at stake to choose a mini-trampoline carelessly. You should also take into consideration the age, size and weight of your kids who are going to be using the mini-trampoline, and choose a model according to their needs. What Are the Safety Precautions Required? Safety always comes first, and with your kids and toddlers jumping around while playing, the last thing you want is an accident. Spring quality determines the jump quality of a mini-trampoline, and it’s important to make sure that the bounce is just right; this makes sure that your back and knees are well-cushioned. This balance is something the top brands in the industry have spent a lot of resources perfecting. This is the first step of setting up your trampoline, and leading brands ensure that it isn’t a complex task, or one that’s difficult to execute safely. While foldable exercisers only need one person to assemble it, a low-quality trampoline might require two or three people and much more strength and effort, not to mention the risk of injuries. Accessibility is everything if you want to make regular use of your exerciser. It’s generally more convenient to have a foldable mini-trampoline that you can tuck away in a place where it doesn’t get in the way, but from where you can quickly grab it whenever you want to take a go on it. Make sure you buy a mini-trampoline that is in line with your needs. Do you want an indoor trampoline or one that is indoor-outdoor compatible? Exactly which family members are planning on bouncing on it? If you have some over-enthusiastic adults amongst those getting in line to have a go jumping on the mat, it’s definitely worth investing in a high-quality, sturdier one to avoid accidental injuries. Also take into account your ceiling height if you are going to be using your exerciser indoors, along with the removal of any fragile or easily-breakable objects from the room or area in which the trampoline is going to be kept. What about the Durability of the Mini-Trampoline? The cushioning of most high-quality trampolines is made of PVC, which is longer-lasting and can survive damp weather conditions. Moisture in the air can really damage your exerciser and by extension, might injure you, as well. All exerciser springs are covered with a cushioning, but while PVC is durable, the other fabric, polyethylene (PE), gives way much quicker. One way to counter this would be to use vinyl covers to cover the mini-trampoline; these can be purchased where the exercisers themselves are sold, and can help to keep it safe and away from moisture. An additional part that is worth buying would be the mesh rings, which are a safety enclosure. Warranty and availability of spare parts for the model are other details you need to find out before making the purchase, to increase the longevity of the exerciser. Nothing like your own experience of jumping up and down on the mini-trampoline to figure out if it’s the right one for you. If you’re indoors, make sure you watch your head! Now that we’ve run you through the buyer’s guide for mini-trampolines, we hope you have a much clearer idea of the sort of model you are looking for, for you and your family. We’ve collated some of the highest-quality mini-trampolines and reviewed them for you, with their specifications, pros and cons of the product, as well as details of where you can purchase the model. This little bouncy exerciser is great for your toddler, between the ages of two and six. The uniquely-designed mini-trampoline is extremely easy and quick to assemble and pretty compact in size to boot. This small nursery trampoline comes out amongst the top products available in this category, with several safety precautions in place as well. This ensures a secure “bouncy” experience for your kids, with little chance of a mishap, on an exerciser that can last for several years. This latest Fold & Go model is ASTM F963-08 Part 1 & Part 2 safety-approved, which means that it meets the standard consumer safety specifications for toy safety, as well as the HR 4040 NEW Federal Government Toy Safety Standards. In case older children are also going to use this exerciser, extension tubes can be purchased separately, along with the mini-trampoline. Lightweight, compact and easy to store. Not ideal for children who are tall or large for their age, adult supervision is recommended. While storing away the trampoline, the process is a little more elaborate, as you have to dismantle and store it. This small exerciser is great for indoor play for your toddler. Since it is lightweight and easily portable, you can also drag it out into the open on sunny afternoons. Durable and long-lasting, the safety features provided by this mini-trampoline should relieve some of the anxieties of parents, and make for hours of safe and entertaining bouncing for the kids. This sturdy, multi-colored trampoline is perfect for kids above the age of two and provides a safe and healthy “bouncing experience” for your excited toddler. Able to sustain a maximum weight of 132 lbs, it comes equipped with a safety enclosure, a long handrail and the jumping mat. The bottom of this mini-trampoline, created with PU cloth, flexible bandage and electrostatic plastic steel, is made from “breathable” cloth and is suitably flexible. An easy-to-understand manual makes the setup process a relatively smooth one, and the jumping area can be customized by you, thanks to the adjustable handrail and standing poles. Only one child can be bouncing up and down on this exerciser at one point, though, so make sure there is an adult supervising the use of this mini-trampoline. Sturdy Construction for Ultimate Safety-- Made of bold steel and coming with 6 legs for added support, this 36" kids trampoline guarantees the great stability. Safety Handrail for Balance Keeping -- The well-padded safety handrail ensures young children can grip well and jump with confidence and not lose their balance while jumping. Protective Cover for Extra Safety -- The circular protective outerwear protects your children from falling onto the hard steel, safeguarding against any strong impact, scratches and abrasions. Easy to Assemble & Disassemble -- From box to fully assembled is in less than 10 minutes. The Round bungee rebounder can be folded for convenient storage or outdoor use. Adjustable Handrail for Long-term Use -- 2 options for the horizontal space ranges (18", 36") and changeable vertical heights (24.5", 36"). Allows to meet the different requirement of the kids as growth. Recommended age is 3 to 6. 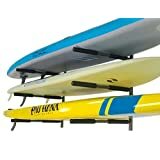 Maximum weight capacity is 132 lbs. Adult supervision is required. Easy to assemble and dismantle, and equipped with foldable ports to store the equipment. This also makes it easily portable. Can be assembled either in an indoor or an outdoor play area for kids. The adjustable handrail risers and handlebar connectors ensure that you can customize your kid’s “bouncing experience”, by being able to choose the horizontal space ranges and the vertical heights. This exerciser has been made with quality materials, with a comfortable bounce mat complete with a safety enclosure covered with cool graffiti. The electrostatic plastic steel that the mini-trampoline is made of ensures safety and reliability of the exerciser. The mini-trampoline comes in a relatively small size and older kids cannot play on it. It can only withstand a weight of 132 lbs and it might break if anyone heavier uses it. If you’re looking for a safe bouncy exerciser for your tiny tot, this is a good pick to go with. Not only do the adjustable handle rail risers and handlebar connectors let you control how high your child can jump, and within what radius, the customizability of this mini-trampoline makes it highly versatile. This 36” mini-trampoline can double up as a bouncy playground for toddlers, as well as an exercise equipment for adults, as the handrail can be attached for the former, and removed, for the latter. Stability, quality of materials used and unique spring construction are some of the biggest strengths of this trampoline, which makes it reliable for long-term use. This trampoline is multi-functional; it can be used for exercise by adults when the handrail is detached, and for play for kids when it is attached. The large jumping surface area of the mini-trampoline also adds to its versatility. Its unique metal spring construction makes it reliable equipment that can be used for years to come. 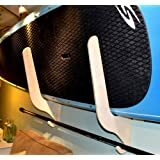 The thick foam of the handrail provides cushioning for you and your kids from injuries and ensures a secure experience. 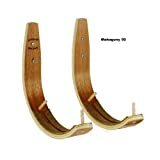 It also comes with eight supporting feet, anti-slip and quiet rubber footpads for further safety. This mini-trampoline has been approved in accordance to all US safety standards. Some reviewers have reported that the pad on the railing comes off, especially if your toddler is teething, as he or she might chew it. If you’re looking for a trampoline that your toddlers, as well as their older siblings, cousins or friends can have some fun with, this is probably the right pick for you. With the array of safety features provided, you hardly have to worry about any mishaps taking place; perhaps you might even be able to sit down for a while, as your children spend time playing on this safe and fun rebounder. 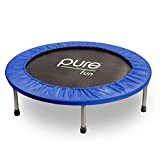 This 36” round mini-trampoline understands the importance of good bounce and elasticity, and has been created with heavy-duty polypropylene material, with the safety measure being at a diameter of 30’’. The padded handlebar and padded and springless frame cover make for great features that let the kids control their bounce in a safe space, by gripping the handlebar. This also means that there are more sorts of exercises your child can do on this, and help build immunity and strong muscles. The material that this mini-trampoline is made of, heavy-duty polypropylene, makes sure that there is enough elasticity to sustain safe and fun bouncing. The padded handlebar and frame cover give the kids a stronger grip, that helps them easily control their movements on a surface that is safe for jumping and durable. Can be easily folded, transported and stored in a way that makes efficient use of space. This easy portability also means you can use it indoors as well as outdoors. This sturdy rebounder has a springfree rebounder jumping mat, that can take up to 150 lbs and can serve as fitness equipment for several members of your family. The step-by-step user manual is easy to understand, and comes with a free kit bag. The cover on the handlebar is something a few reviewers have reported becomes a problem, as it comes off over time. If you’re looking for a no-nonsense, sturdy as hell mini-trampoline, you don’t need to look any further. Versatile, providing great bounce and replete with safety features, this rebounder should have your children bouncing and in great health, in no time. Buying a mini-trampoline is an investment for your whole family, and frankly, one that you shouldn’t scrounge on. There are, of course, rebounders available in all price ranges, but the higher the quality of product you buy, the longer it will last you in good condition, and the safer the experience will be. We suggest you glance through our reviews a second time, and zero in on the mini-trampoline that would be perfect for your home and family. Rebounder trampolines or mini-trampolines are much more than just a passing health fad. Both trampolines and mini-trampolines tap into an activity that is simple, timeless and fun for everyone — jumping. Both are constructed in a similar manner, as well. However, the former is more of a recreational equipment that can be used for exercise as well, while the mini-trampoline is designed specifically for rebounder exercise routines. We’ve put together a buyer’s guide for you that breaks down the basics of going about purchasing a mini-trampoline, and then shortlisted three top picks of products that are worth your time. Rebounding is nothing but using the various benefits of the act of jumping in the form of an exercise, in order to work towards a healthier body. Safe and accessible to a large number of people, one of the best things about rebounding is how it is a full-body workout, while going easy on your joints. Rebounders or mini-trampolines are inherently bouncy, and designed to absorb the impact of the jump, resulting in a very low impact on your joints. Not only is it a great way to spend time and play with your kids, it burns fat and strengthens your core and builds muscle. Let us take you through the science of how rebounding works, before we elaborate on other health benefits that Rebounding offers. What’s the Science behind Rebounding, and How Does It Work? Studies on rebounding have concluded that there is a long list of health benefits that can be attributed to it, and we go into further details into this below. It is estimated that rebounding, as a concept, surfaced approximately 50 years ago, with the idea being to focus on the balls of your feet to create a downward push into the mat; leaning forward with your knees bent slightly, to propel yourself into the air with the bounce of the rebounder to a height of up to six inches, feeling completely and magically “weightless”. This “weightlessness” brings with it a lot of positivity, since it releases feel-good hormones, known as endorphins, into our body. The gravitational pull is what builds momentum in the jumping process, and is really at the core of what makes rebounding an activity that is so positive for your health, not to mention joyful, for literally everybody. An upward “push” action as you bounce upward from the surface of the mat. A feeling of “weightlessness” for a fraction of a second when you’re suspended mid-air. Gravity kicks in, and there is a deceleration in the movement. You bounce against the rebounder with an impact, and are pushed upward again. And thus, this process is repeated every time you jump on a rebounder. Since this is an exercise that is driven completely by gravity, each and every cell in your body reacts to the various impacts and is exercised, which is also why it boosts overall mitochondrial function and cell energy. Whether you’re a college student or working professional who is finding it hard to exercise, or a parent looking for a way to tire out hyperactive children, adding a rebounder to your house comes with a long list of health benefits. It’s a full-body workout that burns fat quickly. It strengthens the core and tones upper body and leg muscles. A study has shown that the “up and down” motion that is created because of gravity is great for the lymphatic system, which itself runs vertically in the human body, as it increases lymphocyte activity. Boosts the functioning of the cardiovascular system and the immune system. Rebounding also has many benefits for women, as it helps strengthen their pelvic floor. Increases bone mass and is very beneficial for the skeletal system. There is low impact on your joints and fewer chances of injury. 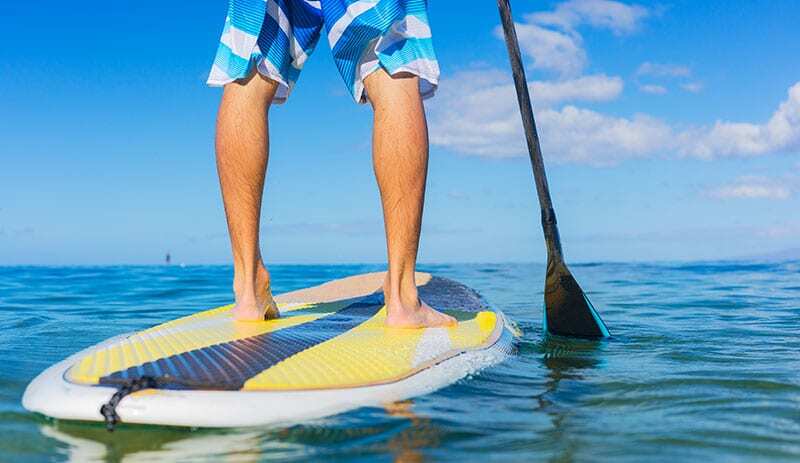 Increases coordination, relieves stress and effectively burns large amounts of calories. With a rebounder, you can literally just bounce your way to health. Absolutely anyone can do rebound exercises. You can do this at home with the guidance of Youtube videos and tutorials, or in the gym. 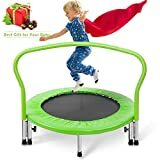 What Do I Look out for While Buying a Mini-Trampoline for Rebounding? As rebounders are used mainly for aerobic exercise routines, it’s good to have an idea of your own purpose of buying a rebounder. Is there a particular part of your body that you want to focus on working out, in particular? Are you looking to build strength in certain muscles? Since mini-trampolines are too small to practice stunts like flips on, you can include variations so that there are aerobic elements incorporated into your workout as well. For example, you can hold dumbbells while on the rebounder, or practice a variation of the box jump, where you jump on and off the mini-trampoline. Another great thing about mini-trampolines is that they are easily portable, so not only can you use this equipment at home, you can travel with it and use it for working out in a gym. While rebounders come in various sizes, it is narrower in width and closer down to the ground, elevated at no more than a foot or two off the ground, as compared to a normal trampoline. In diameter, a rebounder is approximately two to four feet. There is overall less risk while using a rebounder, compared to a trampoline, as it is smaller, for both adults as well as kids. Although both, trampolines and rebounders can be customized, the accessories for rebounders are designed specifically for certain workouts. 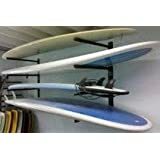 For instance, you can get yourself a stabilizer bar that will help to improve the stability of your rebounder while also offering you a bar to use as a grip for your aerobic workouts. On the other hand, trampoline accessories are designed to make trampolines safer to use. What Type of Rebounder Should I Look For? Mini-trampolines come in various shapes and sizes, and come in foldable as well as non-foldable models. Available across different brands, both types of exercisers are equally durable, but the foldable kind does end up being much more convenient and accessible for everyday use. Quality takes precedence while purchasing a mini-trampoline; you can choose between a spring trampoline and a bungee cord trampoline, so check the bounce to see what suits you best. When it comes to elasticity, spring trampolines have less elasticity, since they have a much shorter suspension, and hence, there is less bounce. These are usually cheaper, have a shorter lifespan and require a good level of upkeep. On a cord bungee rebounder, the mat or base is securely tied to the rim with strong, elastic cords. Due to these durable and stretchable cords, you can bounce higher on this type of mini-trampoline without having to worry about sustaining injuries, as there is low impact on ligaments and joints; this is also why you can have longer workout sessions. These bungee trampolines also last a long time, make less squeaky noises when you jump and require minimal upkeep. Here are our top three picks of rebounders along with their reviews, complete with pros, cons and a final verdict on each product. This professional gym rebounder is just the thing for sports and fitness training. Jam-packed with safety features to protect the user, this mini-trampoline can take up to 130 kgs of weight and comes with a stability handlebar included. Not only does it include a free compilation workout DVD with four rebounding workouts that are divided into beginner, intermediate, and advanced levels so that you are really taken through the process of properly and safely, doing rebound techniques through demonstration. 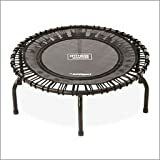 Maximus Pro Gym Rebounder Mini Trampoline with Handle bar. Package Includes Great Compilation Rebound DVD, 3 Months Free Video Membership! 150kg User Weight. The most Robust and High Quality Fitness Rebounder on the market, used by many Professional Athletes and Sports men and women for cardio and core training. Your deep core muscles are engaged involuntary allowing you to produce more core power which is vital for any sport. You will improve, speed agility, balance and coordination giving you the edge over your opponents on the playing field. As used in Thousands of Gyms Worldwide, including Spa's and Holistic Therapists for Detox purposes and Lymphatic Drainage that helps boost your Immune system and rid your fat or toxins allowing you to burn fat more efficiently. Many Validated Researched Fitness and Health Efficacies for best results. This professional gym rebounder is great for those looking to burn fat and lose weight, drain their lymphatic system and train in joint stability. It comes with a free compilation DVD, including four levels of workouts that depict rebound exercise techniques. Many professional athletes have vouched for this high-quality product, especially for cardio and core training. Training and strengthening your inner core muscles is integral while playing any sport and strong core muscles bring with them an improvement in coordination and balance, speed agility and consequently, performance. The advance spring system in the rebounder has been designed to result in minimum impact on your joints. The mat of this mini-trampoline is equipped with a non-slip surface. Comes with spring-loaded legs that make it easy to store and assemble. This is a standard fitness size rebounder that weighs 12 kgs, so it’s heavy enough to firmly stay put while being used and will not tip over like its lower-quality counterparts. There have been a few reviews reporting issues with the cords and springs of the mini-trampoline coming off after a certain amount of use. This product is on the expensive side. This is professional gym exercise equipment that is durable and very simple to assemble. Since it is foldable, you can have it out in the open most of the time, and fold it up in case you have guests over, or whenever you need more space. Easy to store and easy to transport, this gym rebounder certainly has a lot going for it. With a weight capacity of 250 lbs this Pure Fun Mini Rebounder is excellent for core-strengthening routines and also provides you with a good cardiovascular exercise at a sustained elevated heart rate that minimizes the risk of cardiac disease and improves your overall health. The outer spring pad of the trampoline is cushioned, for a safer bouncing experience. This is a durable and long-lasting rebounder, created with steel supports tipped with rubber and 36 high-tension dual springs. This makes for the perfect bounce. The jump mat of the rebounder has been constructed of heavy-duty polypropylene. Quick and simple to set up, without the need for any additional tools. Since these rebounders are compact and portable, they can be used for indoor as well as outdoor exercise. You need two people to set up the mini-trampoline, as the silver cover is relatively difficult to stretch onto the trampoline. Some reviewers have mentioned their preference for foldable legs, instead of detachable ones, so that it would be easier to store. Some users have found it to be relatively small in size, especially for side-to-side motions, and some issues with broken springs. This is a great and durable product that can have a long lifespan, if maintained properly and used safely. Reviewers have also mentioned that they received positive customer support, which helps to extend the life of this value-for-money product further. With a cushioned spring pad constructed of heavy-duty polypropylene, this rebounder is chock-full of features to give you the perfect bouncing experience, that is a blend of exercise and fun. JumpSport is a renowned and well-respected name in the trampoline industry, with the founder Mark Publicover actually being the one who, about 20 years ago, invented the trampoline enclosure, that is very much required when used by kids. 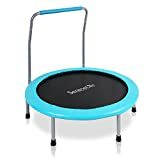 This particular mini-trampoline is great for weight loss, cardio, balance and coordination and overall mental health, since it provides a whole-body workout. The best part? It comes to you practically pre-assembled so you don’t have to wrack your brains and sweat it out for hours in order to set it up. 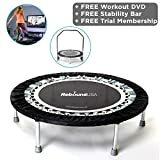 JumpSport 220 Fitness Trampoline | Safe & Stable Non-Tipping Arched Legs | Large Surface| Smooth Silent Bounce | Long Lasting Premium Bungees | Top Rated Quality & Durability | Music Workout DVD Incl. Patented No-Tip arched legs provide unmatched stability and safety. Comes almost fully assembled! Patented arched legs without tips support the mat reliably, making for a stable and safe bouncing experience. They also make sure that the rebounder doesn’t tip over, like old-school rebounders. Space is definitely an area where this rebounder scores, as the integrated permatron skirt of 4 inches that covers the cords acts as a safety feature. It also adds practically 50% more space, making for a much larger jumping surface of 882 sq feet for play and exercise. The more space you have to experiment and exercise in, the larger the range of workout modalities there are that open up to you. Top of the line, when it comes to safety standards and stability. You don’t have to worry about getting injured on this rebounder. The bounce is practically noiseless and does not disturb the surroundings when in use. JumpSport is a family-owned company based out of the USA, with all their products designed and engineered entirely in the USA. Constructed by a brand that is a leader in the industry. This rebounder is relatively expensive. User responses to the size of the mat vary, with some finding it too small and others, too large. 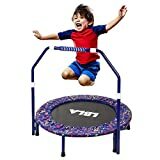 Some reviewers have reported that this mini-trampoline gets worn out pretty quickly, depending on the use. When it’s high-intensity training you want to focus on, or those that work on balance and coordination, this smooth rebounder is well-equipped for your personal fitness goals. The lifespan of this virtually silent product also tends to be almost four times longer than other products. Are You Ready to Create Your Own Bouncing Experience? Now that you have gone through our buyer’s guide and our reviews of the top three mini-trampolines worth checking out, we hope you have a much clearer idea of what to look out for. As with any product, when purchasing a rebounder, you need to identify your own personal fitness goals and customization preferences so that you can shortlist the kind of products that would be the best fit. From boosting your immune system to improved cardiovascular health, rebounders provide a full-body workout. Considering the range of health benefits that a rebounder offers, this is quite a gift to anyone who receives it. With the option of foldable mini-trampolines, this becomes a bounce party you can carry with you wherever you like — the gym, up to the roof or out for a picnic. The possibilities are endless with customizations like these, and with so many choices, you get to choose exactly the kind of rebounding experience you want.